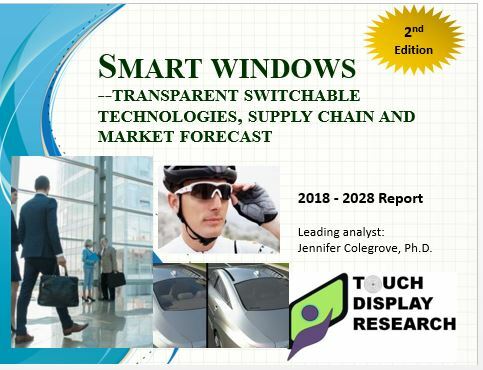 Smart Windows 2018-2028 Report Available - Touch Display Research, Inc.
Santa Clara, California, May 14, 2018— In the recently published “Smart Windows Transparent Switchable Technologies, Supply Chain and Market Forecast 2018-2028 Report,” Touch Display Research Inc., a market research and consulting firm, analyzes twenty two types of smart window technologies, which include nineteen active smart window technologies, three passive smart window technologies, and one type that can be both active and passive. 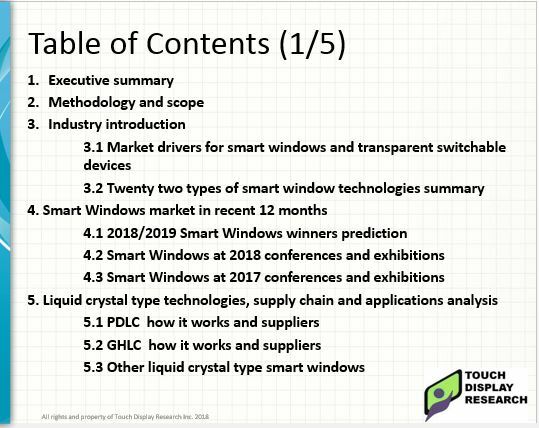 More than 140 companies working on smart window technologies are profiled in the report. This is the 2nd edition with many update over the first edition (which was published in 2017).